The Vanguard Cadets became the first-ever World Champion of the newly formed Open Class today, passing Blue Devils B in the last day of competition to claim their second Championship title ever. 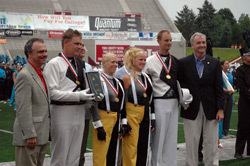 A narrow margin of just five hundredths of a point separated the gold from the silver, as the Vanguard Cadets (1st, 96.825) received caption awards in visual performance, brass and percussion. 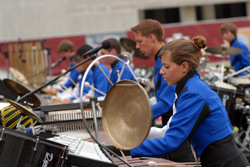 Blue Devils B (2nd, 96.775) claimed the General Effect caption plaque, as well as the Spirit of Disney Award. The Jersey Surf (3rd, 96.050) took the bronze, while the best color guard caption went to the Citations. 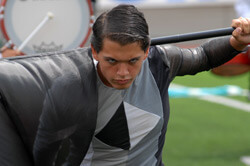 "We've had an absolutely wonderful season here," said Brandon Beck, drum major with the Vanguard Cadets. "We had the show of our lives today, and I don't think any placement really mattered to us. It's just great to be here. [The corps] has worked incredible hours and is made up of some of the greatest people I could ever be around. I love them with all my heart and I can't wait to go celebrate with them." "I just feel so honored to have marched with all of these incredible people," said Vanguard Cadets color guard member Rachel Li. 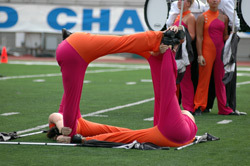 "In my three years, even though it's the same corps, it's never actually the same. I may never see some of these people again, and it's kind of heartbreaking that it's over, but I want to remember the best times and the worst times and how we got through them. "You know, that's the way the game goes," said Rick Odello, director of Blue Devils B after the corps received the silver medal. "It's been a great season for us and I couldn't be prouder of our members. I'm proud of the Open Class and all of the shows put out this year, so we're happy with our position, and we're proud to get our medal. You can't take anything away from the incredible competition we've had this season." "I feel incredible right now," said Jersey Surf drum major and age-out member Christopher Garten, as he stood at the awards ceremony with the bronze medal around his neck. 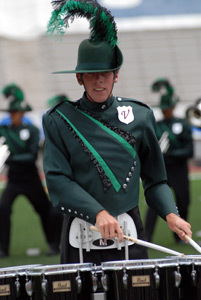 "This show is the best way to go out of my marching career. I'm immensely proud of everyone in our corps. I can't wait to see what next year holds for the corps, it's going to be something big." The Oregon Crusaders placed 4th, receiving a score of 93.025. Rick Vranish, drum major with the corps, said, "The end of the season has been amazing for a really small drum corps doing really big things. We started out with only 62 people and we made two point leaps or greater at every single show. So we're a 62-member corps fighting it out and winning against 145 member corps, and we're happy with what we've done." Vranish said the group set a corps record this season earning a score of 93.325 at the Semifinals. 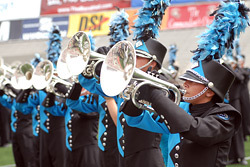 Teal Sound, celebrating its 10th year of competition, placed 5th with a score of 92.775. Adrienne Bedsole, 22, marched as a member of the corps this season as their ranks swelled to 135 members from only 75 two years ago. She said, "Overall this is the best show I've ever performed and have ever been a part of. I'm really excited. I don't care for a score, I'm just really glad we had a great show. I can't wait to watch it on the DVD." Citations placed 6th today, receiving the caption award for best color guard and a score of 92.450. Mike Rawding, a second year member of the corps and drum major for 2008, said, "Today was a big show for everyone in the corps. The last few years with the Citations have been years of growth. We've been adding members, staff, and new equipment, and it felt really good to get all the way to the Finals this year. It's the first time we have been there since 1986." Spokane Thunder members qualified for their first-ever World Championship Finals this season and placed 7th today with a score of 91.025. "It's home to me," said Becca Harvey, a mellophone player with Spokane Thunder in her third year with the corps. "I don't think I can ever leave." She gave credit to the staff for charging up the corps, recalling, "They told us that we have the chance to go out there and really shock some people, and whether they were breathing down our necks or cheering us on, we wanted to make a difference. We wanted to be the first Spokane Thunder to make it to the Finals. We wanted to show what we could do." With a score of 88.650 in 8th place was Revolution. Jake Edel played tuba with the corps and aged-out after four years as a member of Revolution. He said, "Today's performance was the best of the season. We peaked at just the right time and the crowd really got into our show. We played with a lot of emotion today because we knew it was going to be our last time together. It's bittersweet to be aging-out right now. My body needs to take a break, but my soul wants to keep going." In 9th place was Raiders, with a score of 86.250. Color guard member Jacquelin Echevarria said, "Today's performance was amazing. The adrenaline kicked in and I just went for it. I went all the way and left it all out there on the field. I'm speechless. I'm so happy that we were able to get to this point and I'm definitely coming back next year." Dutch Boy placed 10th, receiving a score of 84.975. Bass drummer Tim Chartrand said, "Every second we've worked on the show has been worth it. The road here has been difficult at times, but I'm glad we are here at Finals." Corinne Tucker, a trumpet player with Dutch Boy, said, "Today's show was great, and there was a lot of energy on the field. I definitely walked away from the show feeling great; it's been a lot of fun." Memphis Sound placed 11th with a score of 84.400. Stanley Webster, drum major in his first season with the corps, said, "Today's show was amazing. It was the best run we've done all season. The members have worked really hard and today's performance was a great pay off. This season was more than I expected it to be. I'm very grateful to have to have been given the opportunity to do this." Yamato rounded out the Open Class competition, placing 12th with a score of 84.200. Wendy Natividad, an age-out member of the baritone section, said, "I'm very eager to come back and help out in the coming years on administrative or instructional staff. I want to pass along information and share the experiences I've had with new members." Her sister, Yamato drum major Donnaly Natividad simply said, "It was amazing to perform at Finals this year. All of our hard work has paid off." The International Class champion for the 2008 season is Beatrix, uncontested with a score of 84.825. "Our show today was very good," said Beatrix director Henk Rosendal. "It was the best performance of our tour. We've been working and training very hard, and everything we've done has been worth it. I'm very happy. We have been on tour six times already, and this is the first time we've made the Finals." Beatrix had little time to celebrate, departing Memorial Stadium promptly after the awards ceremony, heading back to New York to catch a flight to their home in Hilversum, the Netherlands. As the Open Class World Champions, the Vanguard Cadets will have the opportunity to perform before the World Class Championship Finals tonight prior to the start of the competition. It will be the capstone of an exciting and memorable season to mark the advent of the Open Class, and a celebration for all of the corps who helped make the first year of this new class so unforgettable. Photos, video and assistance by Corey Davis, Johnny Gilbert, Christina Mavroudis, Josh Peterson, Chris Weber.